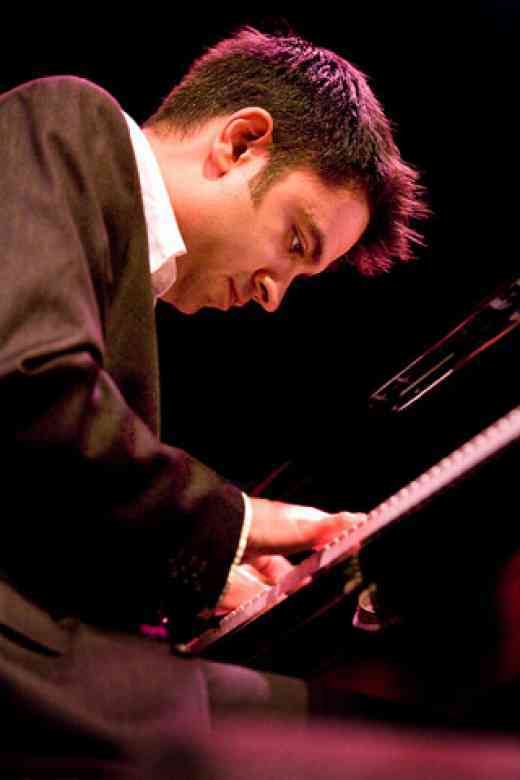 His most recent honors include an unprecedented “quintuple crown” in the Down Beat International Critics Poll (winning Jazz Artist of the Year, Pianist of the Year, Jazz Album of the Year, Jazz Group of the Year, and Rising Star Composer categories), as well as the $275,000 Doris Duke Performing Artist Award. Iyer has released sixteen albums as a leader; his most recent, Accelerando (2012) is an intense, visceral, and widely acclaimed follow-up to the multiple-award-winning Historicity (2009), both featuring the Vijay Iyer Trio (Iyer, piano; Marcus Gilmore, drums; Stephan Crump, bass). His compositions have been commissioned or performed by The Silk Road Ensemble, Ethel, Brentano String Quartet, JACK Quartet, American Composers Orchestra, Hermès Ensemble, and Imani Winds. A polymath whose career has spanned the sciences, the humanities and the arts, Iyer received an interdisciplinary Ph.D. in the cognitive science of music from the University of California, Berkeley. He has published articles in Journal of Consciousness Studies, Wire, Music Perception, JazzTimes, and The Best Writing on Mathematics: 2010. In 2013, he will become Director of Banff Centre’s International Workshop in Jazz and Creative Music, an annual 3-week program in Alberta, Canada founded by piano legend Oscar Peterson. You began Suzuki violin lessons at the age of three. 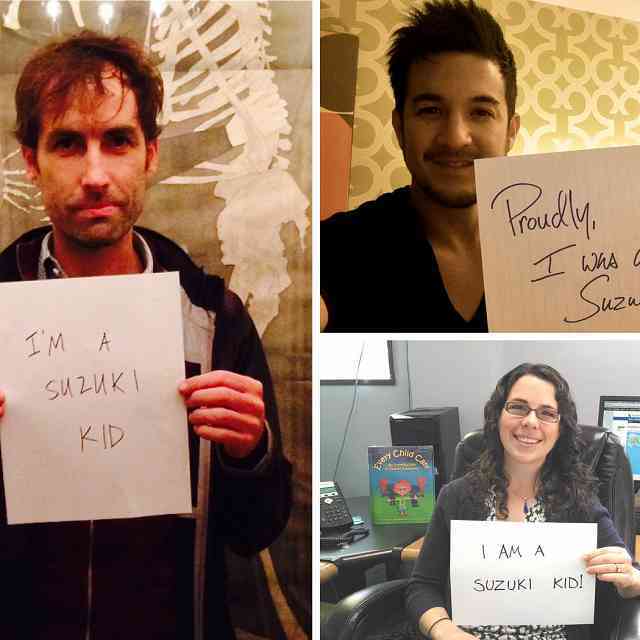 What memories do you have of your years as a Suzuki student? A lot of it has been reactivated from being a Suzuki parent. My daughter started Suzuki violin lessons when she was three and that was four years ago, so I’ve been reliving a lot of that and it’s been coming back to me. What I remember most is what it gave me, which then ended up becoming the foundation of what I do today. Suzuki gave me a really strong foundation as a listener. It helped me really understand what I was hearing and transfer that knowledge to action. Learning how to play by ear meant that there was a direct connection between what you heard and what you did; a set of skills all working together. That was really important because that’s how I then learned to play piano—just by figuring things out on my sister’s piano. I think that early ear training was the foundation I needed. A key component in Suzuki education is parental involvement. How did your parents support your musical journey? My mother was involved in my practicing and it was all new to her, too. She sat through everything and helped me remember what we did in lessons. What was nice about our journey is that my mother was learning with me. She never took up the violin, but she witnessed it all. She was there and she was very dedicated. In my case now, my daughter gets frustrated because I seem to know too much! On the other hand, the way piano worked for me was through no involvement of anybody. Somehow it just accumulated on its own, but it was, again, a byproduct of violin training. Suzuki broke away from the traditional understanding of talent, this idea that people must be born with some magical gift enabling them to succeed musically. What are your thoughts on the origins of excellence? I had always known there to be exceptional prodigies around and I never saw myself as one of them. I didn’t see myself in that vein. But I also felt like music could be in anybody’s life. It’s not like “You’re not a prodigy, therefore you don’t deserve to play music.” For me, having had music in my life for as long as I can remember has helped create something, nurtured a set of skills and a sensibility that I think, when taken together, are indistinguishable from talent. Music, particularly collectively synchronized, rhythmic activity in a group, is a skill that humankind has that becomes a force for community. I knew kids who practiced more than I did. But, by the time I was in high school I had been playing longer than most people. I had a head start on violin. And then there was all-state orchestra. That was always a humbling experience. Realizing that, even after this time, there is still plenty more to learn, still more to do. I think that helped me keep it in perspective. I was the best in my school but then there were many schools. At all-state, I was just average. But that was okay. I didn’t feel like a loser or anything. I was just glad that I had music in my life. Playing in orchestras really made a difference for me. 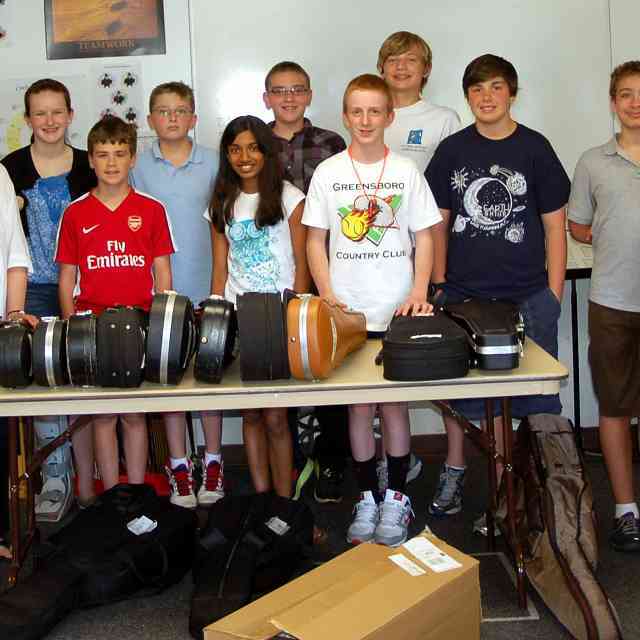 Orchestra brought a whole social component to music making; music-making as something we do together. That feeling of it being a collective experience is one thing has kept me in music all along. You’ve described music as an opportunity to “assert community.” Suzuki believed music can be a force for nurturing kindness and social character. His end goal was really a more peaceful world. That’s certainly in line with how I think of it. Although, I don’t try to make it a moral thing. For instance, music has also been used to wage war. So, I don’t want to pretend that music is a pure force for good in the world. I feel that music, particularly collectively synchronized, rhythmic activity in a group is a skill that humankind has that becomes a force for community—meaning, for us to be able to do anything together. Which can then, of course, be good or bad. But it is something that enables us to do anything together. Suzuki was able to surmount these notions of difference in order to get at a much more fundamental truth about who and what we are. I would put it in more primary terms. It’s not even that it is a tool for building community; it is why we have community. Music is the kind of thing we are able to experience together and do together that becomes the foundation for us doing anything together—which is what community is. It puts it in a sort of pre-moral domain. It’s not that it is a force for good in the world—it can be and I like it to be, but it’s really a force for collective experience, and that itself can be good. For me, traveling around the world and being able to share and create and be at the center of collective experience, night after night—often in places where people have never seen or interacted with someone like me, with my particular background—it forces people to accept your humanity, just in this fundamental sense that we’re made of the same stuff, we can share this experience. That’s where music can cut across these notions of difference, cultural and otherwise. I think Suzuki is someone who is an example of that in his achievements in the world. That his view of music has had such an impact all over the world is a testament to that. He was a Japanese man who was taking up European classical music and he was able to do that and surmount these notions of difference in order to get at a much more fundamental truth about who and what we are. Music enables me to connect artistically with a lot of different kinds of people, from musicians in jazz to musicians outside of jazz to people in other areas of the arts to complete non-artists. You are a San Francisco Performances artist in residence. 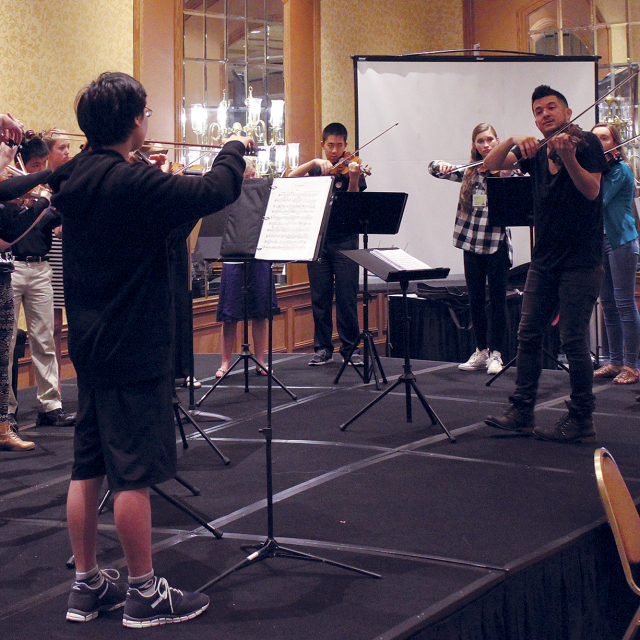 You perform, not only in concert halls, but also classrooms and community centers. You also give lectures and master classes all over the country. 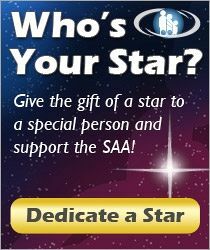 Do you feel a responsibility to give back? I do think about how infrequently I came into contact with lifelong artists when I was little. But whenever I did, it was a cataclysmic event. When I was in first grade and Garth Fagan Dance Company came to our school—I still remember it. You never forget events like that from your childhood because it exposes you to a whole other reality and the fact that this can also be you, a person can also do this. That can change lives. That is one simple truth that keeps me going, keeps me engaged. In an interview you gave through the Silk Road Project you said that you “value limitations.” Can you speak more about that? I think when I said that I was speaking as a composer. Making creative choices when there are no ground rules or constraints whatsoever can be a little bit paralyzing because it’s hard to know what to do next. So I find that sometimes just imposing some restrictions on myself helps. The analogy I would use is writing a haiku. It’s a very constrained form but the number of possibilities is infinite. You have to make choices. It doesn’t really limit the possibilities, it limits your choices. You can set small tasks for yourself so that you can start building little by little. That’s how it works for me. Music is a gift that belongs to all of us. Never let go of it. It can be in your life in any way that you want it to be. I think this notion of limitations came when I was in my early twenties. I was trying to figure out how to keep creating in a way that would push me beyond the immediate sphere of what I could hear; what was obvious to me. I realized that, if I just always stuck with the music that was in my head, then I would never really develop. I wanted to reach beyond the music in my head, so I adopted some sort of formal procedures, haiku-like things—only using these pitches or dealing with something in this rhythmic cycle—I would almost call them puzzles, except they were more than puzzles to me because I was bringing some musical sensibility to it. It’s a compositional technique, a way to challenge my ear. The media likes to attempt define you as “brilliant scientist turned musician” or not just jazz pianist, but Indian jazz pianist. When I look at what you are doing, though—whether it’s composing in response to an unfinished Mozart quartet or collaborating with Mike Ladd it seems that you are working to create is a sustainable career that defies categorization and seeks to break down barriers. I wouldn’t say that I’m avidly trying to defy category, I just don’t find that being in a category is a useful way to be a creative person. I think I’m really just trying to follow creative influence wherever it leads. And also to collaborate with people, music as this occasion for us to do something together. Music enables me to connect artistically with a lot of different kinds of people, from musicians in jazz to musicians outside of jazz to people in other areas of the arts to complete non-artists. The running theme is collaboration. And when you harmonize with another person, just as it is in any kind of human interaction when you are spending any length of time with another person, you grow from it and some new aspect of yourself is highlighted. So I guess that’s the real goal for me. I have one last question for all the students out there. There is an element of novelty and excitement at the beginning of music lessons. The instrument is this beautiful new thing that you get to touch and play and it makes sound! But there comes a point when the student discovers that it actually takes a lot of work and persistence to play with ease and excellence. What advice to you have for a student who has just discovered that mastering an instrument is difficult? The only thing I would say is that music is a gift that belongs to all of us. Never let go of it. It can be in your life in any way that you want it to be. It’s one of the greatest things that we can do as people. You will always be grateful to have it in your life.